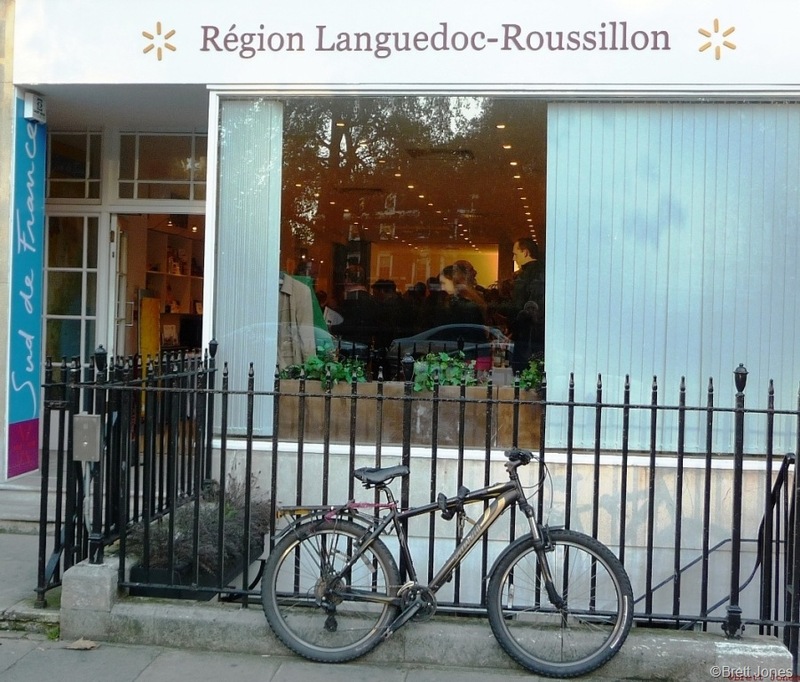 It seemed appropriate that the one sunny day last week was the day of the Languedoc Outsiders tasting in the heart of London, at La Maison de Languedoc-Rousillon in Cavendish Square. Languedoc-Roussillon, once the home of cheap and cheerful wine, has had to rethink its wine making over the last 30 years as wine consumption has fallen in France. Consequently this warm, sunny region in the south east of France has become one the most innovative. The Outsiders are an informal group of good wine producers, none of whom is a native of Languedoc-Roussillon – they are all ‘immigrants’. All keen people, they are from far and wide: UK, USA, Holland, New Zealand, Switzerland and even Bordeaux! And it was a Bordelais I met first: Vianney Fabre of Château d’Anglès who told me, in impeccable English, about this historic estate in La Clape that his father, Eric, bought 10 years ago when he left his job in Bordeaux as technical director of Château Lafite Rothschild. Vianney worked for Bollinger as export director following serious studies so brings a depth of knowledge and enthusiasm to this family estate of 36 hectares. Catherine Wallace, with 15 years’ experience of the UK wine trade, decided to make her own wine.So, with her partner, they bought the biodynamic Château Combebelle. Its 11 hectare vineyard planted with Syrah and Grenache is the highest vineyard in St Chinian producing mainly red with a little rosé. Her wines are warm, spicy and very inviting! 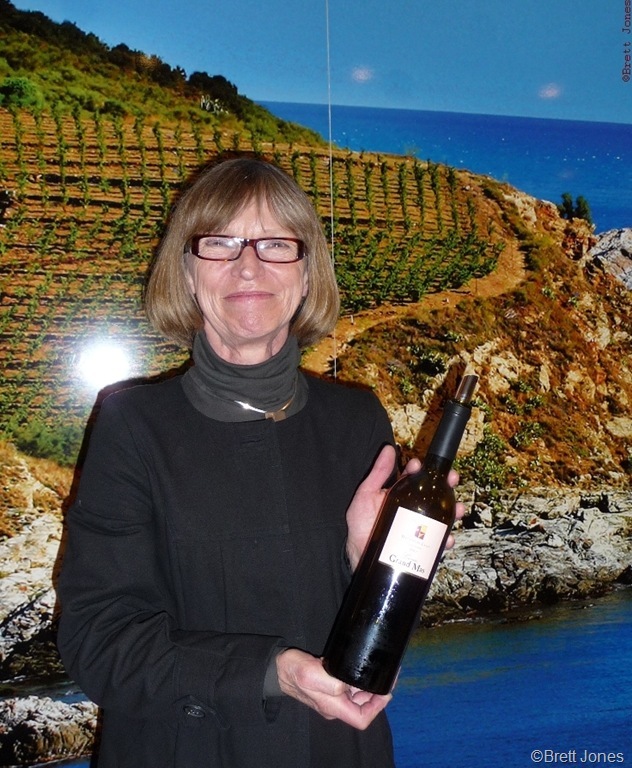 Brigitte Chevalier of Domaine Cébène is the second emigrant from Bordeaux, where she had worked as export manager with Jean-Luc Thunevin. As well as making wine with bought-in grapes she also has 2 organically-farmed vineyards, one in Faugères the other in Corneilhan, only 2km from the Mediterranean. 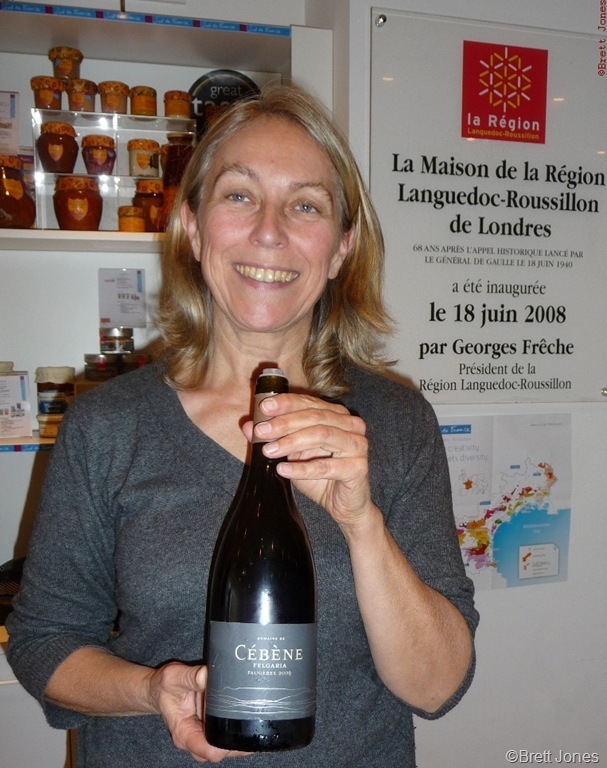 Her wines show a finesse and a style which is more akin to regions well to the north of Languedoc-Roussillon. Dutch woman Lidewij van Wilgen bought the Mas des Dames estate in 2002. Insecticides and chemical fertilisers aren’t used, the grapes are harvested manually to produce a small range of two Coteaux de Languedoc and two Vin de Pays d’Oc. Using no oak, the wines are ‘original, but definitely from the Languedoc’. Ten years ago Englishman Jon Hesford and Kiwi Rachel Treloar decided that their life needed a change of direction, so Jon studied and became a qualified Viticulturist and Oenologist. 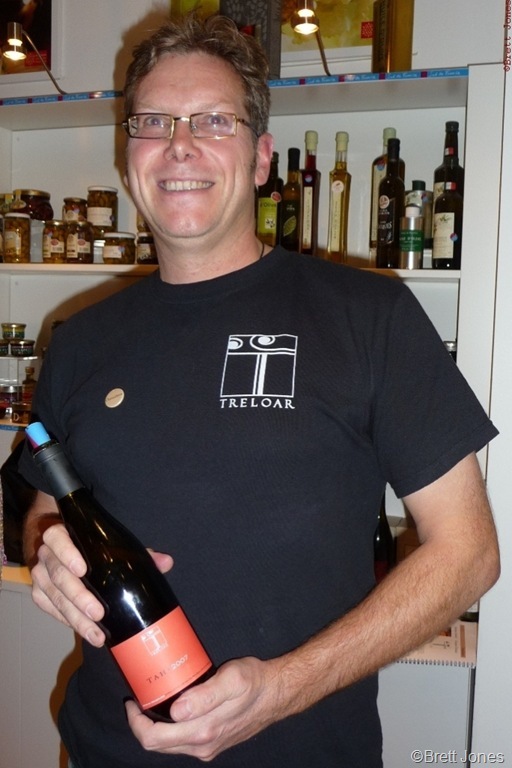 In 2005 they bought Domaine Treloar, an ancient winery. They did a huge amount of work to modernise the winery as well sorting out the 10 hectares of vineyards on hillside sites in the Aspres sub-region of Roussillon. Their wines show an individuality and style with smoky, rich reds and bright crisp whites. Hildegard Horat’s 8 hectare organic estate, La Grange de Quatre Sous, is between Saint-Chinian and St-Jean de Minervois. She left her native Switzerland in 1983 (so is an early Outsider!) to establish a vineyard, where she only makes Vin de Pays d’Oc wines. She has planted quite a collection of regional and international varieties which include the Swiss Petite Arvine. Hildegard produces interesting blends exhibiting individuality with lovely fruity ripeness. 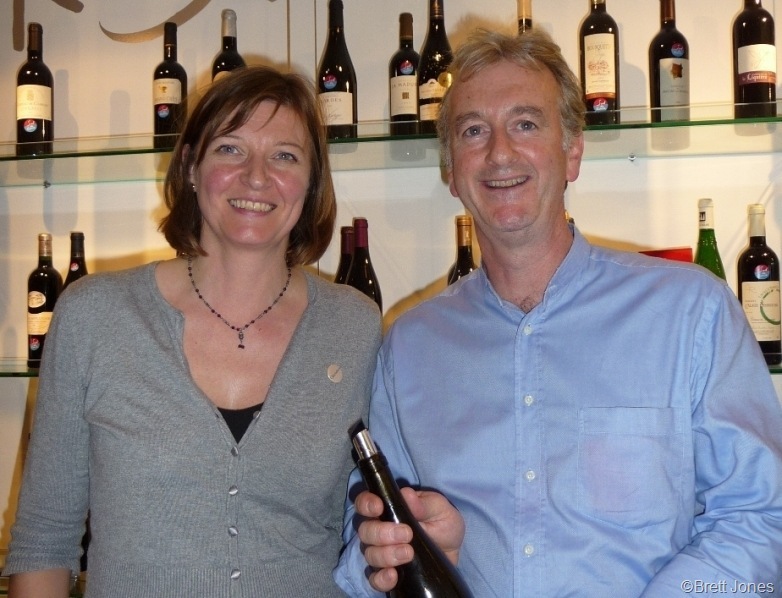 In 2006, after a long search, English couple Peter & Deborah Core bought the small 6 hectare organic domaine, Mas Gabriel. They had left England in 2002 to learn grape growing and wine making in New Zealand – obviously a good training ground for quality wine. The volcanic basalt soils of their vineyard amplify the minerality of their wines. 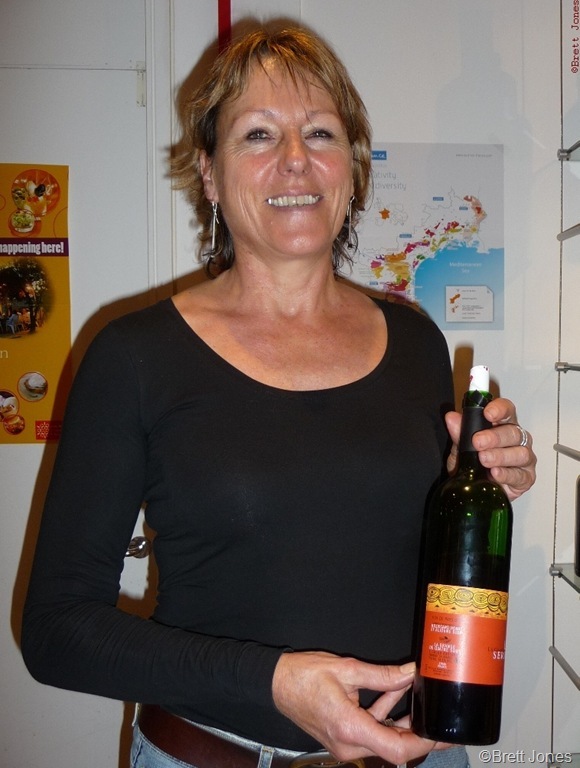 Anna-Lena Gentes, together with her husband Yvon, spent 30 years in her native Sweden before coming to live in Southern France, where they bought a run-down domaine, Domaine de Calet, in Costières de Nîmes. Soon to become organic their 38 hectares of vines have been put in good order, producing stylish wines with bags of character. A few years ago I enjoyed an early vintage of Hegarty Chamans so was delighted to see that Sir John Hegarty and his partner Philippa Crane are Outsiders! In 2002 they bought their 20 hectare estate in the Minervois region. Both their whites and reds show a clarity of rich, bright flavours, very much a product of organic, soon to be certified biodynamic, vine husbandry. Ten years ago Caryl Panman and her husband Jan bought Château Rives-Blanques, high in the hills of Limoux, a region famed for the good sparkling wine, Crémant de Limoux. As well as lively sparklers, both white and rosé, their 22 hectares of vineyards, some with the round galet stones similar to Châteuneuf-du-Pape, are planted with Chardonnay, Pinot Noir, Sauvignon, local Mauzac and Chenin Blanc. If I still had my wine bar this lady would provide my house wine: Domaine Jones! 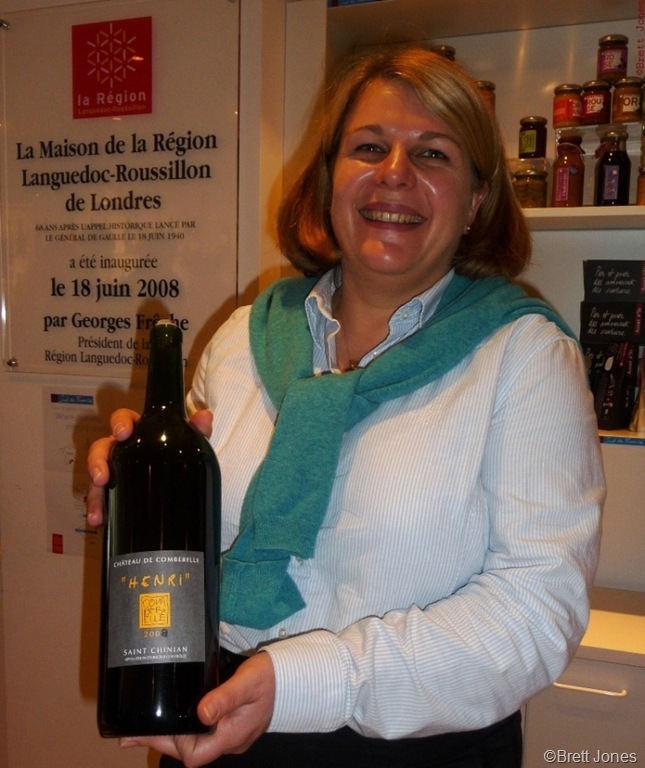 Katie Jones had worked for 16 years in sales for a Languedoc cooperative. In 2007 she bought 2.7 hectares of 60 year old Grenache vines in Maury, then another small plot of mixed vines. 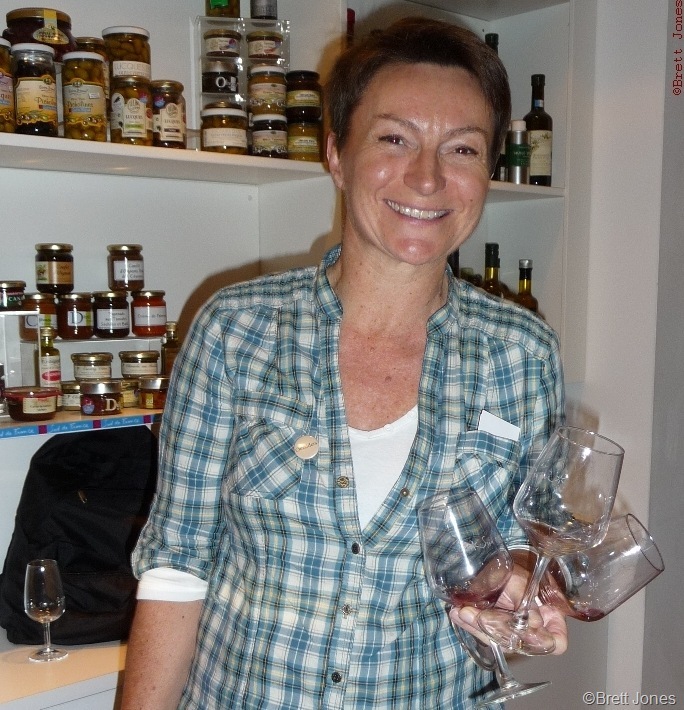 She produces idiosyncratic wines with flair. 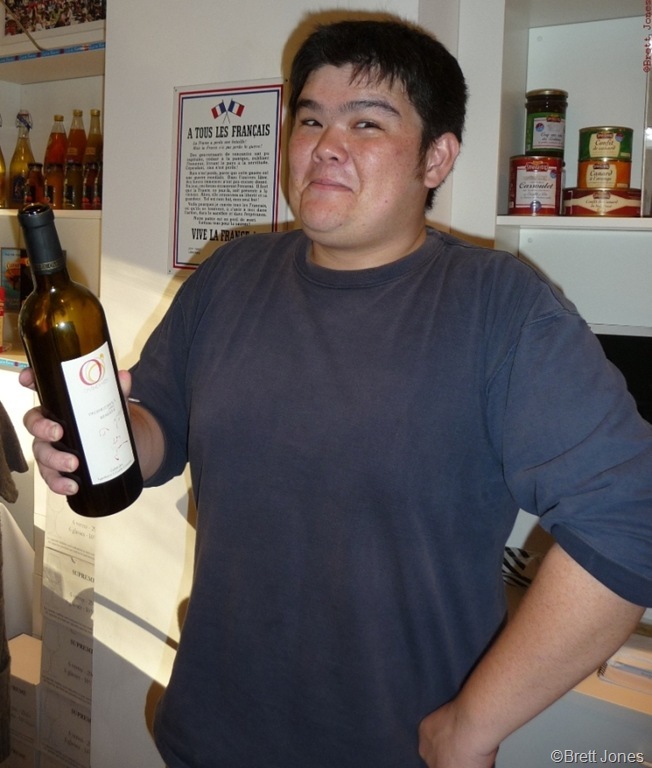 Ryan O’Connell, the cheeky chappy, together with his parents, Joe (American) and Liz (French Vietnamese) moved from Florida in 2005 to set up the O’Vineyards in Cabardes, within view of Carcassonne. They now produce a range of five robust, rich red wines made with Merlot, Syrah and Cabernet Sauvignon. 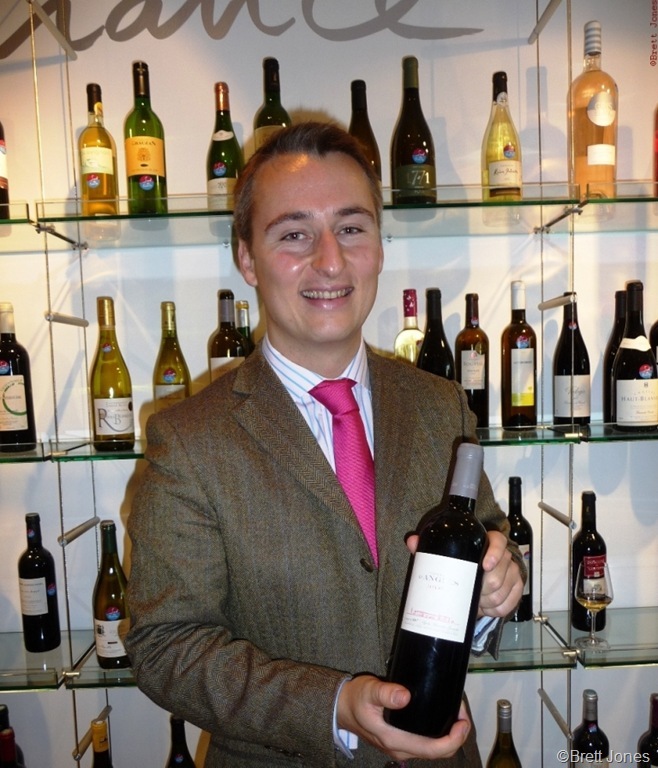 Ryan is a great ambassador for the Languedoc, the Outsiders and la joie de vivre. 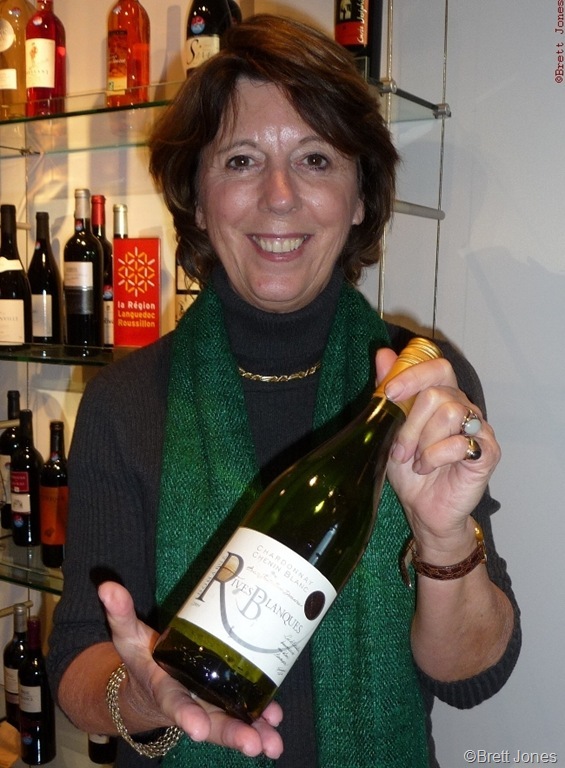 This excellent tasting was set up by the founder of this informal group, Louise Hurren. 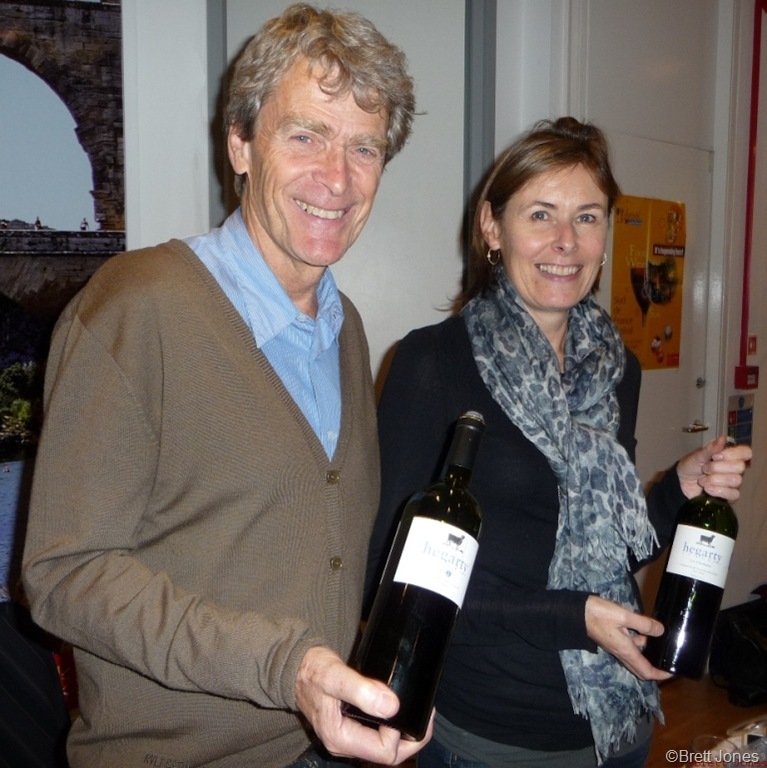 And the event certainly lived up to its description: Outsiders – Rocking the Languedoc Wine Scene. I enjoyed the variety and quality (and small quantity) of wines, as well as the opportunity to talk to all the producers whose pride in the region is so obvious. Thank you, Louise and all the Outsiders. Some, but not all. of the Outsider’s wines are available for sale in the UK. Visit each winery website for further details. This entry was posted in Wine, Wine Blog and tagged Château Combebelle, Château d'Anglès, Château Rives-Blanques, Domaine Cébène, Domaine de Calet, Domaine Jones, Domaine Treloar, Hegarty Chamans, La Grange de Quatre Sous, Languedoc Outsiders, Mas des Dames, Mas Gabriel, O’Vineyards by Brett, the Wine Maestro. Bookmark the permalink. Thanks, Brett for this great summary of such an interesting tasting. And, for the pictures that will remind us what all these enthusiastic producers look like! I have to say that the tasting inspired me to go down to the Languedoc again soon – there is such a buzz about the place – and it’s fairly obvious that it’s the Outsiders that are shaking things up down there.